They say breakfast is the most important meal of they day, and this summer I am spending a little more time on breakfast prep so I can start my days off on a healthy and happy note. I honestly can't get enough fruits during the season, and blueberries have been quite a favorite this year. 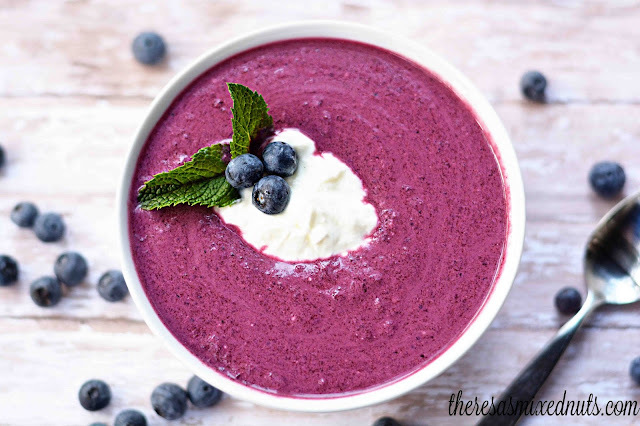 Jason and I have both been mixing them in our Greek yogurt each morning, but I thought I'd try something different this week and make Chilled Blueberry Soup from Golden Blossom Honey. I know it's called "soup", but it's more like a blueberry smoothie. You could puree it and put it in a glass and drink it that way, but I really like the novelty of eating it with a spoon out of a bowl. It makes a much tastier and healthier breakfast than a bowl of cereal! What's on your summertime breakfast menu? I should make this for Isaak today. It's something he can eat with a numb mouth. We have yogurt and blueberries to! wow, it looks so yum. When my father used to visit states, (I was small) he used to bring the teddy honey bottles..lovely flashback of memory! This sounds like a great breakfast. So far this summer when I eat breakfast it has been cereal with almond milk. I would have never thought of blueberry soup. This sounds delicious and perfect for summer mornings! I have a silly question. This looks like a smoothie in a bowl to me. What is the difference LOL? For us, breakfasts are the simplest. We just do cereal, toast or eggs. Anything more, it doesn't get eaten. I could try this for an afternoon snack though. Well now that is unique. You come up with the coolest recipes. I have never heard of blueberry soup before. Sounds refreshing and healthy! Your soup looks beautiful. I bet that would be perfect for a really hot summer day. Wow, I would have to substitute greek yogurt to stick with my eating plan but it still sounds amazing. What a great way to start the day or even an afternoon snack. It would be so nice to wake up to this soup. This looks really yummy. This soup is so beautiful and has such beautiful colors. I can imagine that it has some delectable flavors to enjoy on our palates. I can see myself eating this outside on my patio on a sunny summer morning. :) It looks delicious! Mmm looks so delicious! I wouldn't mind having that for breakfast too! That's different. I think it'd be a great dessert. This sounds so interesting. I'll have to give it a try. I'll be including it in my summer berry round up. 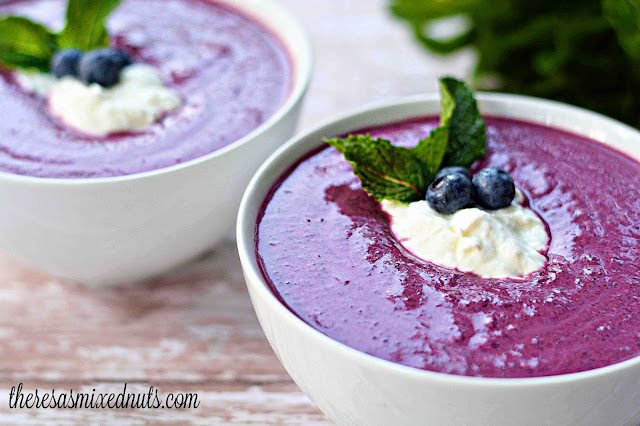 Can you use frozen blueberries to make this?